Brain and Nerd's indie 4X space strategy game Predestination was Kickstarted by you. Now you can find us on Steam! 1,195 backers pledged $49,899 to help bring this project to life. 60% funded! New trailer video, and stretch goals revealed! We've hit 60% funding with over 27 days left to go! 60% is a special milestone because Kickstarter statistics show that 98% of projects that reach this level of funding are successful. We have some way to go before we hit our minimum funding goal, but I'd like to use this opportunity to reveal our first two stretch goals and show off our new trailer. $30,000 - Hotseat Multiplayer and Play-by-Email: I didn't realise how much people wanted play-by-email support until I launched the Kickstarter and started getting comments and emails asking for it. It turns out that a lot of people want asynchronous multiplayer where they can take their turns at their own pace. 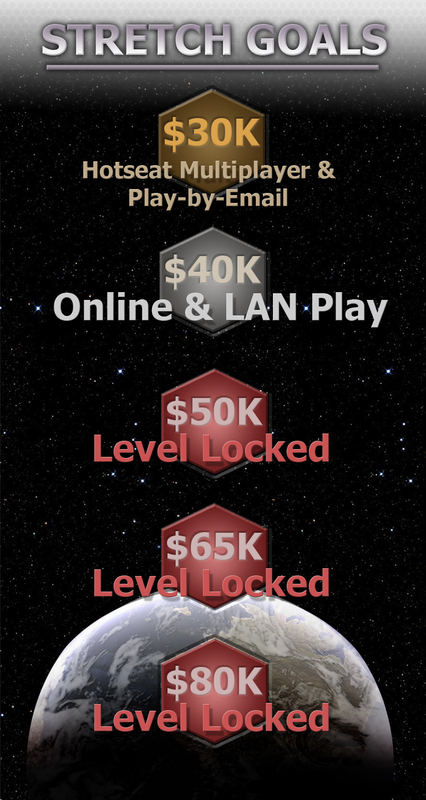 If we exceed our goal by $5,000, I'll be able to develop hotseat multiplayer and play-by-email. I'll also look into the possibility of split-screen multiplayer. These types of multiplayer can be produced without working on complicated netcode, so we won't need much extra funding to get them in. $40,000 - Free Online Multiplayer: This is one feature I absolutely need to get into Predestination, so if we don't hit this stretch goal I'll aim to add online multiplayer in a patch several months after release. Developing and debugging secure netcode can take a lot of time, so I've set this goal at $40,000 so that I can budget for a second part-time developer to work on netcode while I'm busy working on gameplay. If we hit this goal, we'll be able to get free online multiplayer in for the game's release. Thanks for all of your support, it's really encouraging to see that over 400 people want Predestination to happen! It's especially humbling to see that four people have pledged $500 to design their own level in the game. For anyone who wants to make a bigger mark on the game, I've edited the $1,000 reward level to add something even more exciting: Design one of the game's default races! We've already planned five races, but can add more with your help. Our character artist will work with you to design the art for the race, and you get to pick the race's stats and develop your own backstory that will become canon in the Predestination universe. We'll also work with you to build a singleplayer level introducing the race and its story! Special thanks to everyone who has pledged $25 or more in the name of fighting DRM, and everyone who has shared the Kickstarter and update links on Facebook, Twitter, forums and news sites. Every link helps us to get closer to our goal of making Predestination a reality! Play-by-Email is typically played asynchronously and it can be implemented as simply as a system that sends encrypted save game files back and forth, with each player taking his turn in order. All this requires a functional hotseat multiplayer mode and some jury-rigging to work with email, so we can include both hotseat and PBEM at the same time. That's why we've set it at only the +5k stretch goal. PBEM is great for asynchronous gameplay with friends you know, and it's ideal for 1v1 games. Synchronous online multiplayer is a different story, and that's the gameplay I really want into the game. Speed is more important and all players will want to take their turns at the same time. To do that, we'd have to either build a system to merge the save game files from multiple sources together or send the information on all of the actions the player has performed each turn. Both of those would require a lot more than just hooking PBEM through a web server. Since this multiplayer would be open to the public rather than just letting you play with friends you already know, we'd likely need to add safeguards to prevent cheating. I also want to build a public game lobby server for players to organise on and maybe even a matchmaking and ranking system, because I remember how fun it was to play MOO2 with new people on the Kali league and I want to make that kind of experience simple and accessible to everyone. The free online multiplayer stretch goal won't take away from development time on the core game because I'll still be working on that full time. The extra funds will be used to hire an additional part-time developer to work on the multiplayer service specifically so that I don't have to take time out of the rest of the game. If it turns out there's a much easier way to run the service that doesn't require an extra developer, we'll put the funds toward the next stretch goal. I hope that explains why I want synchronous multiplayer in the game as well as PBEM. Let me know if this doesn't make sense or if you have any more ideas. Coding complexity for peer-to-peer multiplayer is a slight issue. That said it's not actually that hard to implement and test when you understand how it's done. What if the central server goes down and you can't play? What if you want to play the game ten years from now when the servers might be gone? Having both systems is always going to be a benefit. You're missing the point. These are stretch-goals. The money is needed to pay another programmer for their time to implement and test these systems. It's really not that hard to build all of the methods you talk about into the final system. "Free Online Multiplayer: This is one feature I absolutely need to get into Predestination..."
Pardon me for asking but why? Play-by-email should be easily enhanced to play-by-web (where everyone uploads their turns to a central server which processes them and sends back the results once everyone's submitted a turn) and that avoids the coding complexities of online multiplayer (you could term this "offline multiplayer"). I'd far rather see effort spent on enhancing the single-player game (competent AI, detailed space/ground combat, etc) since that is something that benefits everyone.